This installment of the FoTS-series is a whopping 29 pages long, 1 page front cover (with a stunning artwork by master of the macabre Mark Hyzer), 1 page editorial, 1 page SRD and 1 page advertisement, leaving us with a whopping 25 pages of content – quite a bunch, so let’s check this one out! Following my format for FoTS-reviews, let’s first take a look at the supplemental crunchy material provided herein: We get the alterable and Greater Alterable weapon qualities that allow the transformation of weapons into others and a special slotless ring (that can be worn with two others!) that nets the wielder access to the Toppling Spell [Metamagic]-.feat. Template-wise, we get 6 different templates, ranging from CR +2 (Apex Predator template) over the Accelerated Creature template (CR +1), Advanced Creature template(CR +1) to the Young Creature (CR -1) and Locomotion-handicapped Creature template, which clocks in at CR -2. On the spell-section, we get a force-based subduing ray that deals non-lethal damage and a spell to grow more arms. 2 Traits (one related to the dremaburning mechanics of Coliseum Morpheuon),as are 8 feats, three of which are devoted to the Kirin Style and its derivatives, whereas the others allow for firearm creation and knowledge-themed abilities. One wildblooded sorceror-bloodlines also features herein, the Sage (derived from the Arcane bloodline) and additionally, we get the Rakshasa bloodline. We also get two archetypes, first of which would be the smuggler (based on the rogue) and the second being the crossblooded sorceror, who gets less spells, but the abilities of two bloodlines – intriguing and rather cool! The 3 incarnations of Ur-Shogga come as CR 7, 14 and 21, with especially the latter build being AWESOME – here, the creature is an advanced cunning locomotion-handicapped intellect devourer crossblooded wildblooded sorceror 16. Now, usually I’d go all “Beware of SPOILERS” now, but honestly – the cover already shows what Ur-Shogga is about – character-wise, this creature is not dream-scarred as you would expect and rather has dreams – terrible, disturbing dreams, for the creature has infiltrated the souk after escaping from the Khan, being the dread result of the Coliseum’s master’s experiments. As the hyper-intelligent (Int 44!!!!) quintessential schemer, Ur-Shogga is a dreadful grey eminence and an impressive build, but what sets this pdf truly apart would be the sheer amount of additional material. What additional material? Well, we get 4 CR 13 host-bodies, characters in their own right, 4 CR 9 Host-bodies (2 of which are actually different creatures than the CR 13 ones!) and 3 CR 4 host bodies – Ur-Shogga’s favorite host-body featuring in all three versions, while ALL the other host bodies are different. That is 11 additional statblocks, 9 characters – in addition. Wow. Editing and formatting are top-notch, I didn’t notice any glitches. Layout adheres to RiP’s 2-column b/w rune-covered old standard and the artwork of Ur-Shogga is awesome, the other artworks also being nice for the very fair price-point. The pdf is extensively bookmarked for your convenience. WOW. Ever since Nameless Nil, my gold standard for ANY NPC-build, I didn’t expect this series to again reach this level of complexity and sheer material. While character-wise, I still prefer Nil, Ur-Shogga offers A LOT bang for your bucks – far more than it needed to and oh boy is it better off for it. Disturbing, genius-level schemers are hard to pull off and this build with all its supplemental material makes at once for a truly terrifying and yet beatable adversary/manipulator. 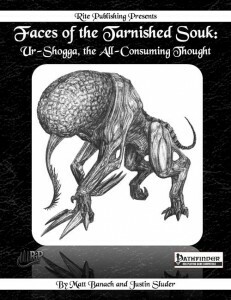 Ur-Shogga ranks as one of the finest installments in the series that has set the gold standard for NPC-builds and time and again upped the ante, not resting on its laurels. This is a superb offering indeed and thus scores easy 5 stars + seal of approval for its very fairly-priced, excellent content.